The series of EUROPA apparatus and its successors was the main stream of Klangfilm sound film systems before the end of WW2. 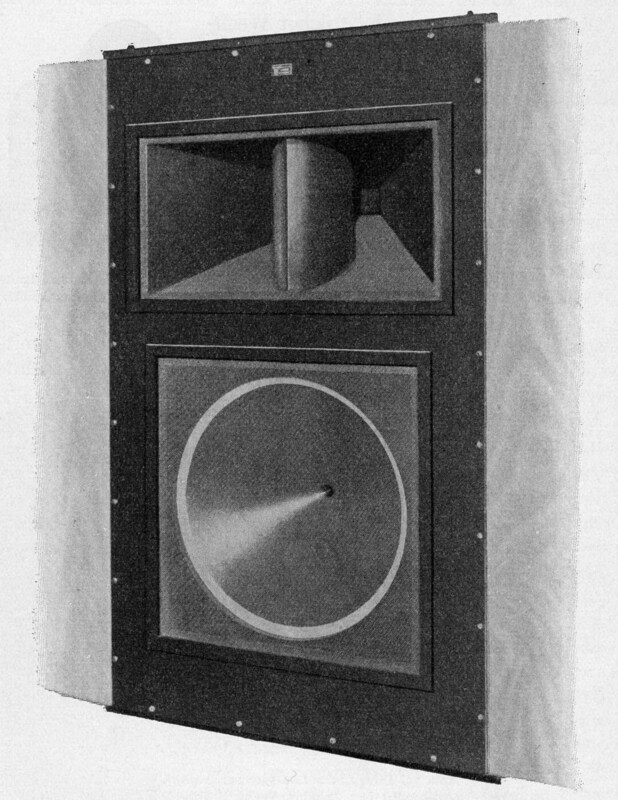 Furthermore EUROPA apparatus was the definitive version of optical sound film systems at the age. 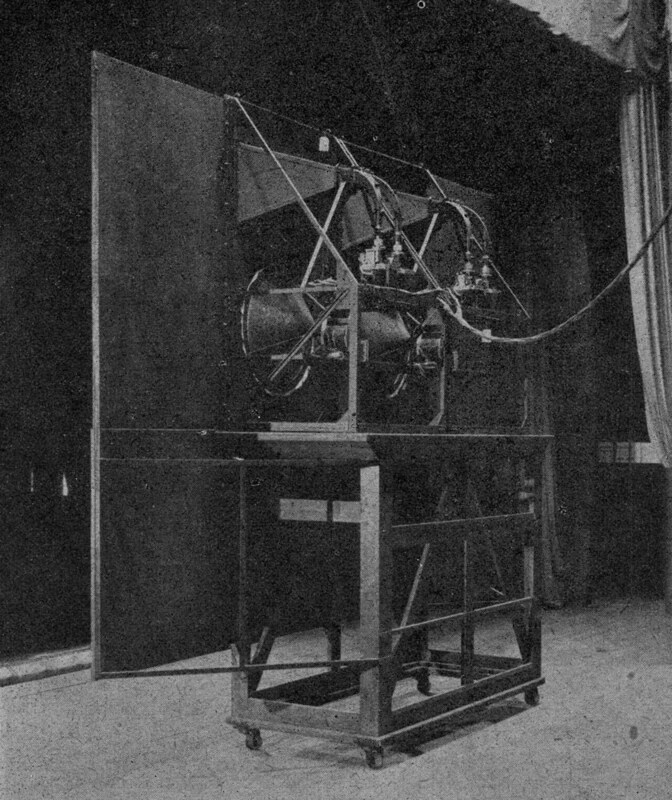 EUROPA amplifier and EUROPA loudspeaker were developed at 1931 and were installed in large theaters in middle Europa and Scandinavia from 1932. 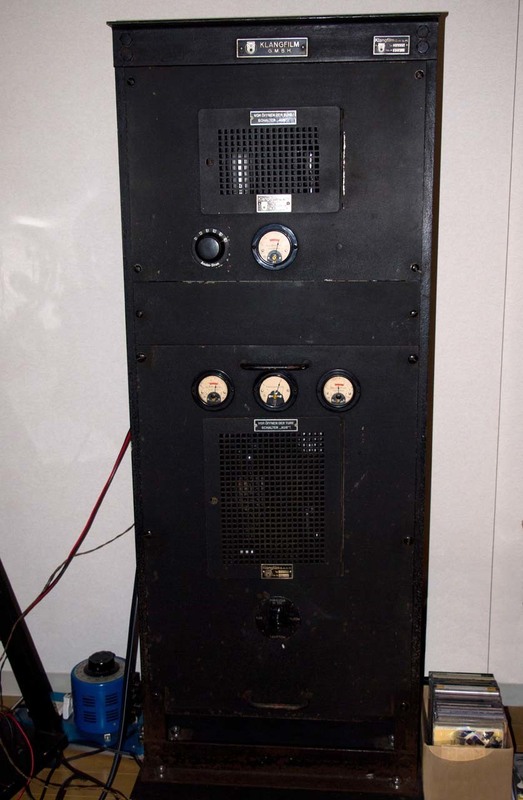 WIDE RANGE sound system of Western Electric was also developed in USA at around same time. 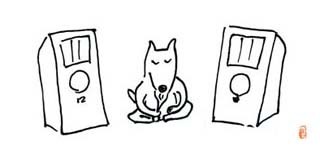 There was a demand to extend the frequency range of sound film systems because optical recording performance was improved. Type 34500 is the known earliest model of EUROPA amplifier and is a rack mounted combination amplifier consists of type 31313 voltage amplifier and type 34702 power amplifier. The circuit of 34702 amplifier is a push-pull final stage of 71508 (= 4K170) tubes from TeKaDe. 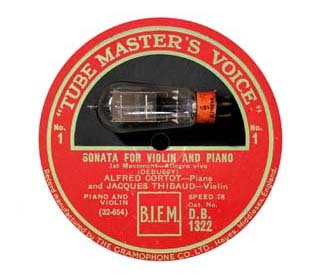 TeKaDe was one of the oldest vacuum tube manufacturers in Germany. 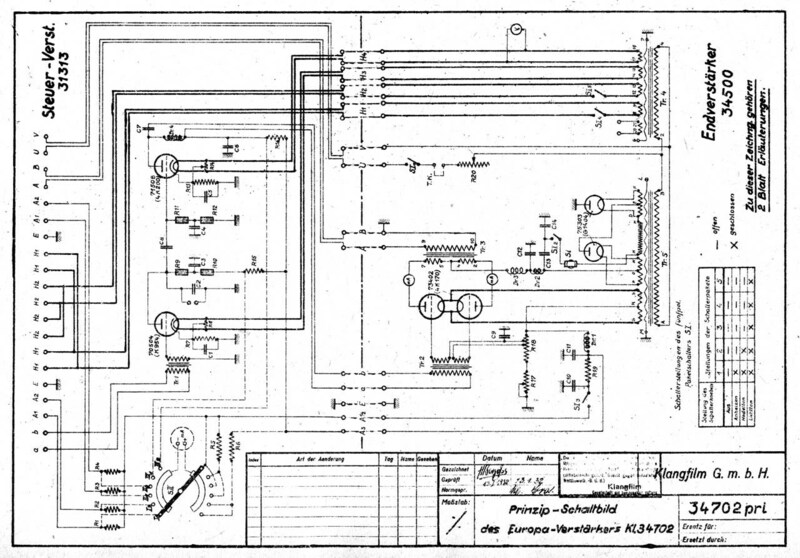 Developments of German vacuum tubes were started by Robert von Lieben and the technic was licenced to 4 manufacturers: Siemens, AEG, Telefunken and TeKaDe. 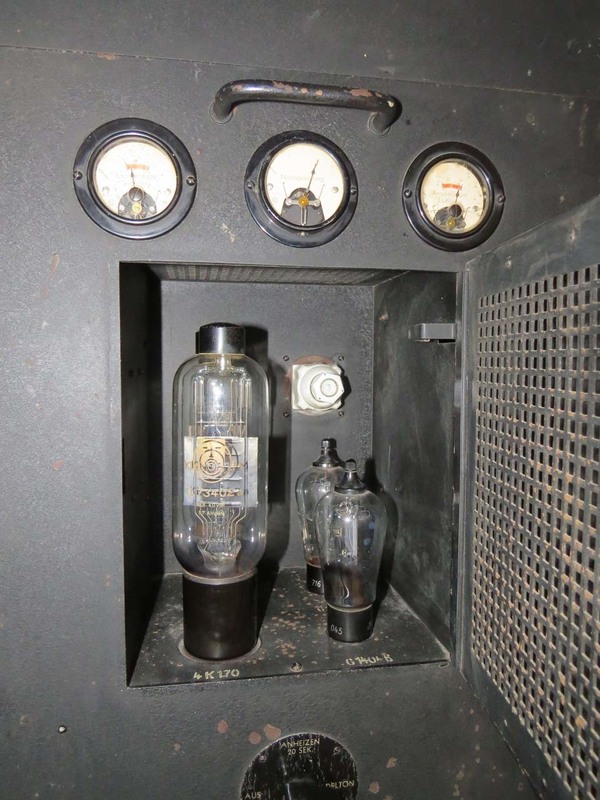 TeKaDe tubes were very rare in Klangfilm amplifiers. 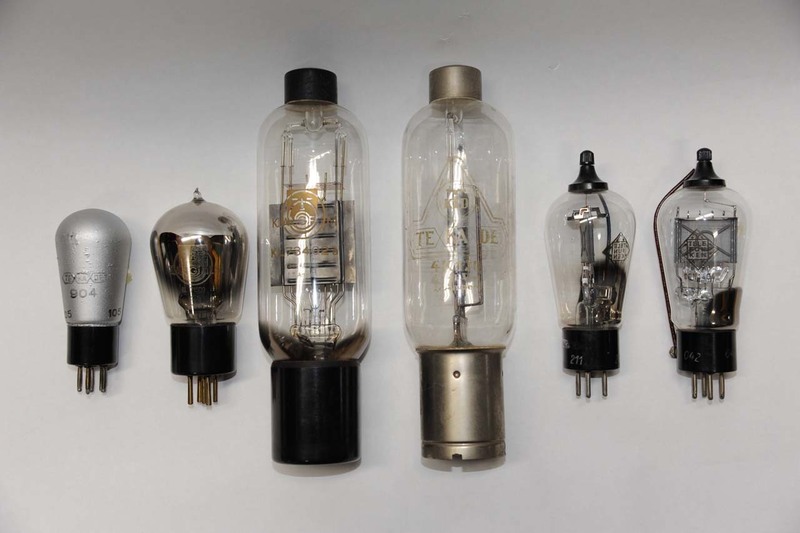 In the original design, the tubes in type 31313 voltage amplifier were TeKaDe K954 and 4K200, but the tubes were replaced by Telefunken REN904 and REN2204 respectively in practical uses. The maximum output power of Type 34702 is estimated to be around 20 W.
If some one knows an existing EUROPA loudspeaker of the early version (type 44007), please let me know. Unfortunately I have never seen it. Perhaps no 44007 EUROPA loudspeaker exists now. 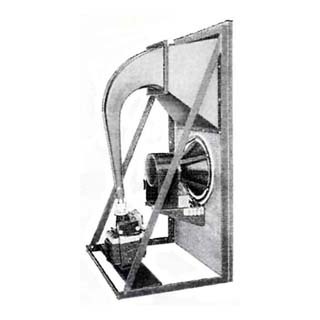 44007 EUROPA loudspeaker consisted of one big bass driver of 70 cm in the outer diameter and two treble drivers of Blatthaller type. 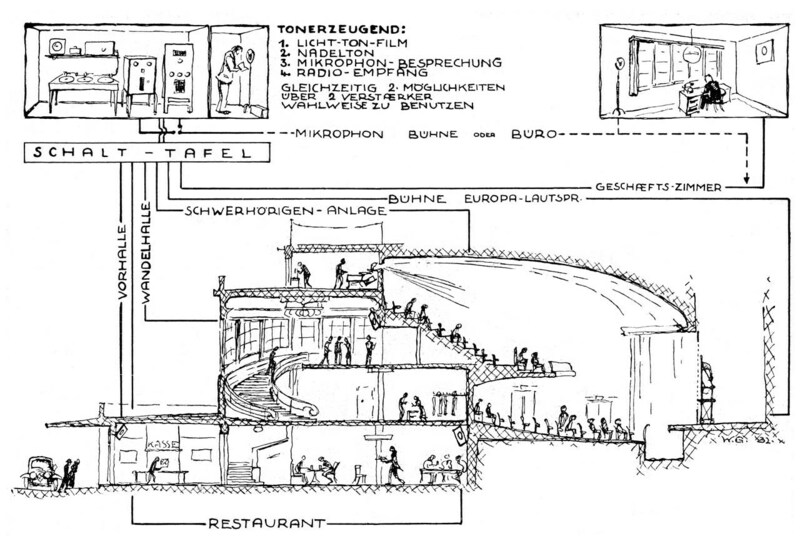 There were two installation types of EUROPA apparatus according to theatre sizes; EUROPA I apparatus for theaters from 800 to 1500 seats and EUROPA II apparatus for more larger theaters up to 4000 seats. Two EUROPA amplifiers and two EUROPA loudspeakers were used in one installation of EUROPA II apparatus.